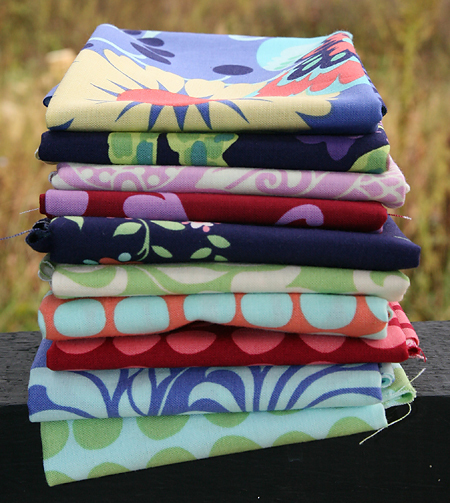 Two weeks ago, I emailed my local quilt shop, Pieceful Heart Fabrics, and asked if they would be getting any of the new Amy Butler line Love. I was hoping they would get at least a bolt or two. They emailed right back and said they were getting the entire line! I was so excited! Yesterday they called and told me it had just arrived. Ironically, I had just left the store an hour earlier. I went back today and bought a bunch of FQs. How lucky am I to have all this fabric only 5 minutes from my house? I have a feeling I'll be going back for more, it's so beautiful!